Community Supported Agriculture (CSA) is a growing movement, which has provided economic support and predictability to farmers, practicing traditional family farming, that they will be able to continue to farm, and that communities will be able to enjoy fresh, local farm products. 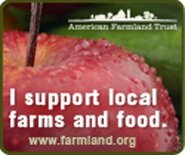 Partnering with local farms by purchasing a “share” in the season’s harvest, consumers can know where their food is coming from and have the satisfaction of supporting local agriculture. Participants, who purchase their shares early in the season, provide the farmer with a stable income, and in return they receive a weekly supply of fresh local farm products. The CSA Network UK maintains a directory of approximately fifty CSAs operating in England, Wales and Scotland. A user-friendly map pinpoints the locations of the CSA farms throughout the United Kingdom. Click Here to link to its directory.